This property has 4 bedrooms, 2 x private double beds with shared washroom. 1 x dorm style room with 4 single beds, 1 dorm style room with 6 single beds. Our beautiful bamboo-made guest house offers tranquility and a sweet homely vibe in the most famous party/surf town in Ecuador. If you're looking for a perfect balance between partying in the centre while being able to relax and sleep like a baby in your hostel then with us you're in the right place. 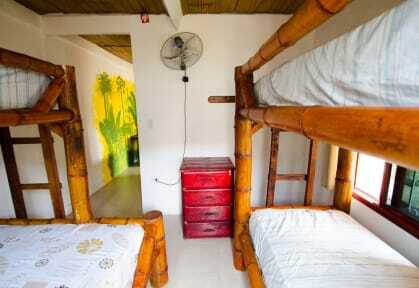 We guarantee you that you won't find a safer, cosier, cleaner and friendlier accommodation in the whole of Montanita. We have two great private double rooms with comfy king size beds, a lovely, spacious dormitory for four people and a six people private room for rent. The six people room consists of three individual bamboo-made beds and one comfy double bed, private bathroom with shower, outside dining area, patio and a separate entrance that allows our guests all the privacy and comfort needed. The private bedrooms and four people dormitory have access to one shared bathroom, an extra restroom, extra shower, fully equipped spacious, clean kitchen, gorgeous bamboo terrace surrounded by greenery and an outside dining/chilling area. Guests staying in the deluxe dorm also have access to all the above mentioned spaces. El Cielo is located in a charming, safe and peaceful neighbourhood of El Tigrillo, the last remaining bit of Montanita's countryside, very different from the commercial, touristy centre. Here you can relax and sleep undisturbed by the loud clubs of Montanita, here you can fall asleep to the sound of crickets and enjoy the omnipresent greenery. The beach and downtown are around 10 minutes stroll away. There is hot water and very good wi fi in the whole property. All the windows have mosquito nets which provide great mosquito protection. For extra safety we have window bars, lockers and we provide each guest with a key to the room (every room, including the dorms, locks!). There is a security cameras system in the whole property. We provide daily house-keeping service free of charge to ensure that our hostel meets the highest cleanliness standards. We leave you complete freedom and privacy but at the same time we can be at your disposal and help you with anything you need any time. We provide up-to-date information about Montanita and all its attractions, we offer discounts on tours and diving courses and we help organize exceptionally cheap, high quality private Spanish classes and amazing 'on the budget' Galapagos tours. What makes us unique is our serene, green, extra safe location that provides perfect conditions for a good night rest and our individual attitude towards the guests- we are truly committed to making your stay here in Montanita as pleasant and flawless as possible. Our dream is for our guests to feel right at home at El Cielo. I really enjoyed my stay here. Monika and Daniel are exceptional hosts, always checking in with you to ensure all is well and they are full of information about Montañita and the surrounding towns, where to eat, the best day trips or tours, etc. The hostel itself is clean, comfortable, and quiet. Far enough outside of town to not have to deal with the noise and rifraff but close enough to walk to restaurants, the beach, etc. I would most definitely stay here again! Had a fantastic stay. Niki and Grant were amazing hosts. Made me and the other guests feel right at home. From playing board games to our morning coffee I always felt like I was part of the hostel family. Thank you for making my stay here great!! One of the best hostel's I have ever stayed in. Everything scores a perfect 10. Stay here! Niki and Grant were great. They made us feel right at home and were never sort of advice on the town or on Ecuador. This hostel is great to get away from the noise of the town and get a good nights sleep. Can't recommend el cielo highly enough. The prefect location of less than 10 minutes walk to beach but still just outside the main hustle and bustle so you're able to get a quiet nights sleep. I booked for 1 week and ending up staying 1 month, mainly due to the hospitality of Niki and Grant. From the moment I walked through the door I was treat more than just a guest. Without question the best hosts I've had while travelling. Would not stay anywhere else is montanita. Thank you so much! We felt like a part of the family from the first second. Monica and Daniel (and their little daughter) where one best hosts we have had in Ecuador so far, they where attentive and helpful in every matters. We had great fun when where sitting together in the nice and green common area, drinking a coffee when it was to hot to anything outside! I stayed here longer than expected. The owners are truly lovely people and very personable. They were always happy to help with anything that I needed and more. It was a great place to sleep if you want to be away from the noise. I would recommend this place to everyone. I can't thank you enough for the amazing stay. Nice place to stay, quite far from the center which isn't the worst but was also sometimes annoying..quite clean not the best. Kitchen was ok but there are animals at the property which I didn't see it was mentioned (and its an important detail..). Really nice hosts.